Police have appealed for information after two teenagers put a wheelie bin on a railway track in Angus. 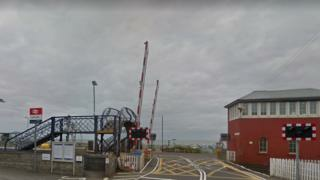 British Transport Police (BTP) attended Carnoustie Railway Station at 19:00 on 21 February after a train driver reported trespassers on the line. Network Rail said the incident delayed an Edinburgh to Aberdeen train which was in the area at the time. A BTP spokeswoman said the two teenagers had left the scene before officers arrived.